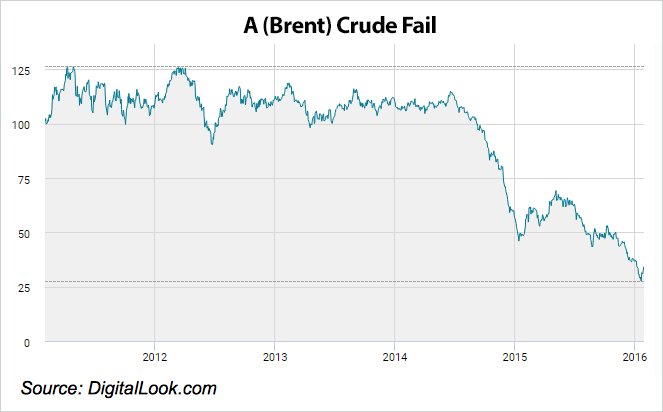 The fall in the price of oil is having some curious side effects. Some of the major oil-producing countries, such as Saudi Arabia, have had to raid their sovereign wealth funds to make up for the loss of revenue. Sales of shares by these funds have been at least partially blamed for global stock market turbulence seen recently. UK government revenue from North Sea Oil taxation is fast disappearing as $30 is an uneconomic price for drilling in such hostile conditions. Mothballed rigs are reported to be accumulating in the Cromarty Firth. The wisdom of some renewable energy projects is being thrown into question. The share price of America’s most famous electric car manufacturer, Tesla, has been hit. Also in the US, the prices of high yield fixed-interest bonds have been under pressure because of the doubtful financial viability of borrowers in the shale oil extraction business. The resulting jitters have rippled across the bond market. The deferral of new exploration and production prompted by the current depressed price could lead to a shortfall in supply – and corresponding price recovery – in a relatively short time. On the other hand, cheap oil is giving a boost to consumers now, in much the same way as a tax cut. Both views offer opportunities for active investment managers to exploit. Do contact us to learn more about the managers we favour in a cheap oil world.